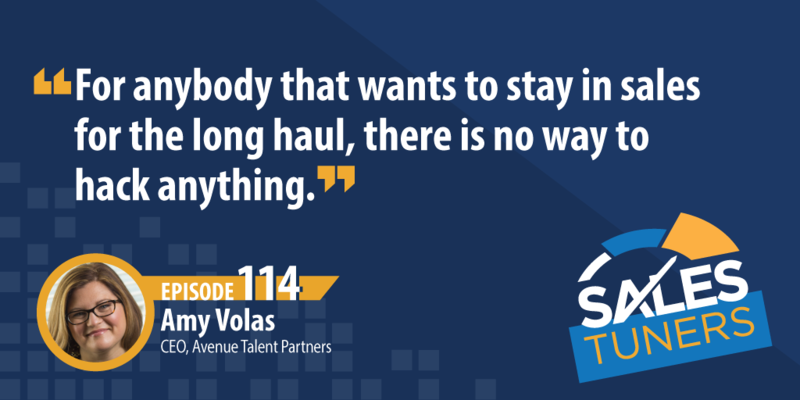 Amy Volas (@AvenueTP) is the Founder and CEO of Avenue Talent Partners. In her 20-year career, she’s closed over $100 million in sales serving in various sales roles —from spearheading national accounts for ZipRecruiter, Gild, Indeed and Yahoo! to exceeding expectations at Jacobson and DataTrend. Today, she applies her vast sales experience helping other startups scale their sales teams. Despite coming from a family of salespeople, Amy initially thought sales as a career was too intimidating and decided to become a recruiter instead. After 9/11 and the aftermath that followed, her CEO gave her the option to join the sales team if she wanted to stay with the company. So she took a leap into the deep end of enterprise sales, learned from trial and error, and never looked back. She credits much of her success to a genuine curiosity of what makes people and businesses tick. In this week’s episode, she shares mindset and communication strategies that will enhance your sales process and maximize the odds for a positive outcome. Use the Information You Get: Every salesperson has been told they need to ask great questions, but here’s the deal, if you don’t actually listen to the buyer and use the information they give you, what was the point to begin with? Yes, you have to uncover some kind of pain and tie it to a compelling event, but how many times have you made your prospect feel like they’ve wasted their time with you by asking questions they’ve already answered either to you or to an SDR who set the meeting for you? I understand you have an agenda you want to get through, but as Amy says, you have #TwoEarsOneMouth for a reason. Connect the Dots: Salesforce is a place for data, not a place for reps to be successful. I know you have sales stages to update but forget about them for just a minute. Go ask the last five customers who bought from you what they liked about their sales experience with you. What didn’t they like? Where did they feel there was friction? As you start to understand what your buyers actually want, you can rebuild your sales process to take advantage of the moments they found delightful. Combine that with the first takeaway, and you’re on the verge of getting the keys to the castle. There are No Hacks: It seems like everyone wants and expects immediate success in today’s worlds. Yet, I’ve met very few sales reps early in their career that wants to actually put in the work. Here’s the reality, if you want to stay in sales for the long haul, you’ve got to realize there aren’t any hacks. You can create efficiencies, but those come from actually doing the work and understanding what you should do more of and what you should abandon. With so much information available to you these days, including podcasts like this, it’s easy to think you know everything. But to truly connect the dots, you need to spend time in the trenches talking to your customers.